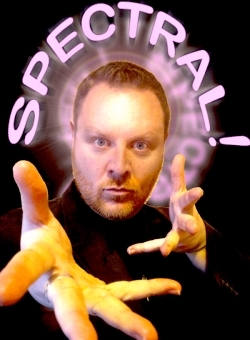 The gifts of Julian D'Angelo, South Wales' Leading Psychic Phenom, have brought pleasure and solace to thousands, he has traveled the world, appearing before the crowned heads of Europe, heads of state and last year was voted Best International Psychic (age 35 - 60) by the National Butcher's Society Of Great Britain. SPECTRAL! An Evening With Julian D'Angelo, South Wales' Leading Psychic Phenom is a rare chance to channel with Julian in an intimate setting, where he tells of his early years, his burgeoning powers and how he met his Spirit Guide, Chief Wiggam. Commune directly with the stars of yesteryear, and should the fluence take him, be connected with your past, or even your future! Who knows where the spirits will lead? As Julian himself says; "I am merely a conduit to the Spectral realm, when the fluence comes over me, all I can do is stand there with my mouth open and let it run its course." Allow Julian to take you on a journey to the Nether Regions and let his gift touch you from the Other Side.